In instrumental music education, the very first thing you do is teach ear training and keyboard skills. And you do that with students who are, frankly, terrible. But anyone can learn perfect pitch (or something close to it, at least). You couple those ears with an understanding of theory, and you’re able to navigate common musical practice. Yet in audio, I’ll bet the vast majority of people making music and working in sound have never had an equivalent training. And yet the essentials of sound, and tools like compression and EQ, are just as dependent on training your ears. You need to couple that training with a sense of theory. 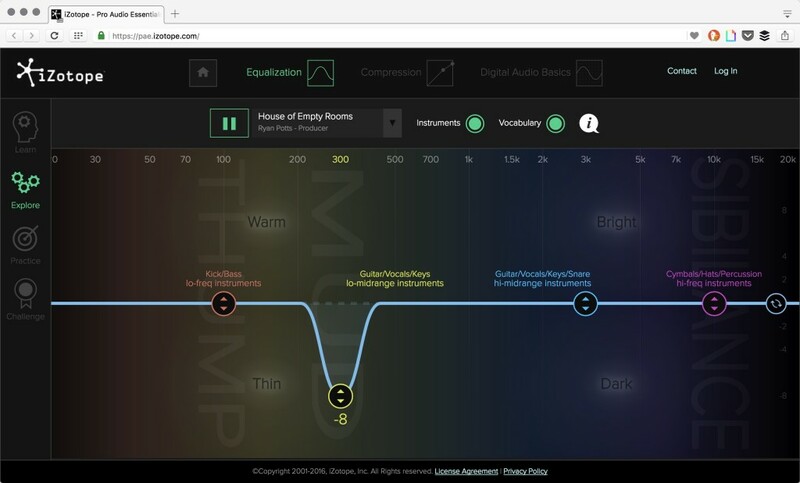 Right in your browser, listen to equalization by band and amount with actual recordings. And music software developers are starting to realize that the more you know, the more you’re likely to use their tools. iZotope had already added extensive education to their offerings – teaching you how mastering works being a great way of getting more mastering customers. But now, they’re doing something much further-reaching, which they call Pro Audio Essentials. And it’s not just lessons – it’s also a game. Video tutorials cover the basics. If you’re entirely new to this stuff, you’ll start at the very beginning – like what equalization is. You can get deeper into stuff that you might be a little shaky on if it’s been a while since you studied audio (like the difference between dBFS, Peak Level, and RMS). Those videos are all on-demand, so you can skip them if you’re not interested. What I suspect almost everyone might be interested in is the Explore, Practice, and Challenge tools. 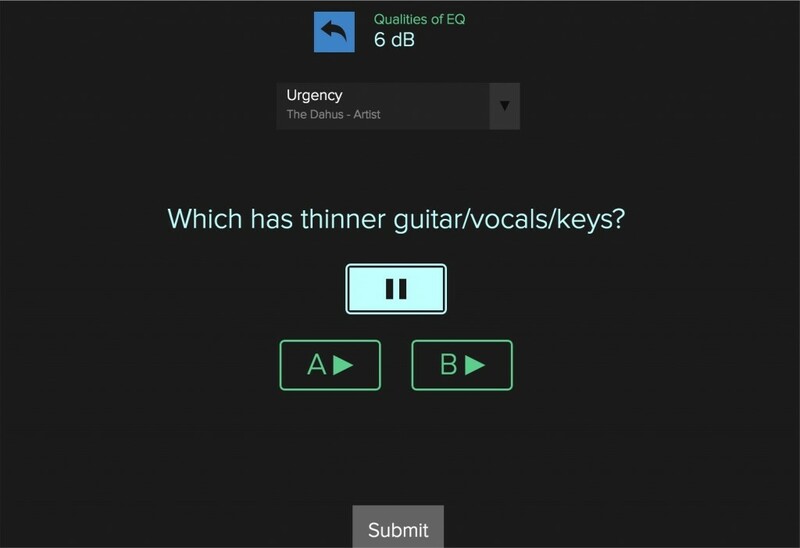 A series of tests lets you practice and challenge yourself – starting with equalization as a topic. These let you play with tools like equalization directly in your browser window, and hear the results. Then, you can actually test and train your hearing. So, with equalization, this means the ability to try to detect difference in amounts of attenuation (in dB), and specific frequency bands. In Challenge mode, you can not only test yourself, but actually try to make targets, matching existing files by ear. And yeah, that could be a fun exercise even if you’ve got a fair bit of experience. It’s kind of a wonderful reversal of current trends, if you think about it. We’ve got plug-ins that purport to match EQ for you; cloud tools that are supposed to replace the mastering engineer. In this case, you’ve got something better: you can actually train your own ears so you can take control of getting the results you want. And since the ability to hear amplitude and frequency matters in creative work, too, that means the power to make your own choices as you produce, too. 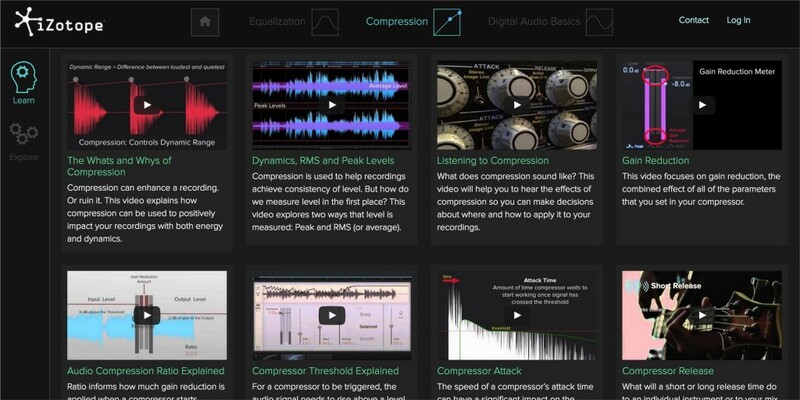 So far, lessons on equalization, compression, and digital audio basics are all available as videos. There’s a practice and challenge mode for equalization (the others aren’t done yet). It seems like a great idea. And it’s terrific to watch this industry wake up to education as being part of what they do. (Ableton’s efforts with Loop and a book on creative strategies also spring to mind.) I expect that trend will spread.